JF Pelchat thought the same thing. In 2004 he filed his first patent and in 2006 he began work on what would become the Now IPO. As with Jones and Yes Snowboards, Nidecker stepped up to the plate on production. With a quality team behind him, production dialed and six years of work into the product, it was time to unveil the IPO binding. 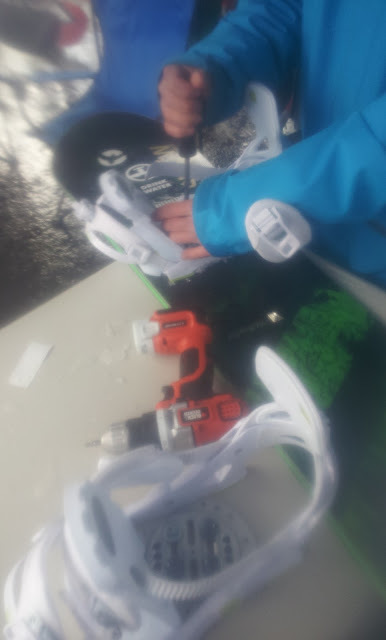 JF was on hand at the Baker Banked Slalom to demo his bindings. As such, he breezed through the setup with the speed and efficiency of someone who has been inside these bindings for six years. I have no idea how long it would have taken me, but I'd imagine no longer than an average binding. Now has one mounting disc to take care of 2-hole sliders, 3-hole and 4-hole insert patterns. The foot pillow that covers the disc gets out of the way without tools. Forward lean is tool-free as per usual. The highbacks are even pre-rotated a few degrees to solve a common problem. I rode the Now IPOs on my Never Summer SL-R with Salomon Dialogue boots. My size 9.5 (US men's) boots went into a medium binding. Now lists 9.5 and smaller boots as their medium size and 10 and bigger as Large. JF set me up with the Medium bushings at the binding-board interface. The fit was great. The first thing I noticed was how tight the heelcup held my boot in place. I couldn't just step out at the end of a run, I had to pull my foot out of the binding. Not difficult, but not effortless. JF mentioned that this is something they're still dialing in for future models. Once I got used to it, I liked that snug feeling. It was like having another strap that locked your heel down without actually having to buckle it. Also, the highback is sandwiched between the heelcup's two loops. This makes it a snap to take out the highback and go no-back style without altering the fit. I'd love to try that, especially on a pow day. Imagine the Japan you could tweak out. Knee to the deck! With the highback in place, flexibility was still good without being gooey. Speaking of the straps, they are standard. Not big and puffy, not bare bones, just medium. Comfortable enough. You can ride the toe strap up top or out front. The vibration absorption of these bindings is next level. Between the 5mm bushings and the 15mm foot pillows Now has your dogs swaddled in EVA for a magic carpet ride through the most unforgiving chop. I'd like to see thinner foot pillow or bushing offerings for a lower ride with more board feel. Again, it could make for a rad pow day. What about response? My main preconceived concern with these bindings was that taking the binding out of direct contact with the board and setting it up on bushings would sacrifice response. Not the case. My board responded as good or better than with traditional bindings. As JF explained, the kingpin and bushing system transfers energy more directly and eliminates the performance-robbing binding warp in other models. Translation, you say "Carve," your board says "How hard?" The bushings bring about another question for me. What about the possibility of setting up the bindings asymmetrically? With snowboards again messing around with asymmetrical sidecuts, could a similar benefit be achieved by putting the hard bushings under your heels and the soft ones under your toes? What about using thinner bushings under the instep to create a cant? One long-term worry I would have with these bindings is the extra moving parts. Add moving parts to a system and you add liabilities. As with any new product, it remains to be seen how rugged these parts will be. The next few years will answer the durability question. I'm intrigued to see where Now will go next. They have some room for improvement, but their IPO was a solid offering. Freestyle, freeride, big mountain, all mountain; I'd say the next big thing in bindings is right here, right Now.